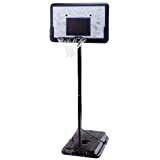 Lifetime 1221 Pro Court Height-Adjustable Portable Basketball System with 44-Inch Backboard – Just $99.00! Get outside and play! Portable, height-adjustable basketball system with 44-Inch backboard, adjusts from 7.5 to 10-Feet 6-Inch increments.